On East Market Street, a 1-minute walk from Edinburgh's prestigious Royal Mile, sits the hub by Premier Inn and the Premier Inn, Edinburgh hotels. 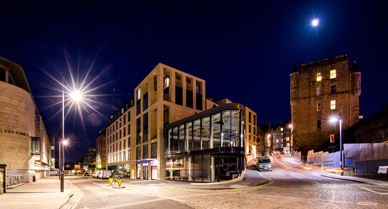 This combined £18 million hotel development is an integral part of the 7.5 acre site that is becoming New Waverley, a vibrant creative, cultural and innovation quarter in the heart of Edinburgh. The 130-bedroom hub hotel is the first hub by Premier Inn to open outside of London. Next to the hub is the 127-bedroom, 6-storey Premier Inn hotel. There are entrances to both hotels on East Market Street and Cranston Street. Comply with country-specific acoustic regulations. Ensure Premier Inn and Scottish-specific building regulation standards were met. Bedrooms that overlook streets with high levels of activity into the early hours of the morning. Recommended how the noise from mechanical ventilation can be reduced where required. Do you have a similar acoustics requirement for your hotel development?